Terry Harris and I have been talking about jornaling lately because it's part of a change program we currently have underway. This is a contest and the winner will be awarded a week long trip to St. Thomas. (Compliments of our very generous broker, Mark Sager.) Participating staff completed an intention card with their goal at the beginning of the program. In July, they'll submit a reflection statement and a journal that tells their story. The journal can be in any form -- blog, video, photographs, diary, scrapbook, anything someone can think of to convey their journey. An external panel of experts will review the entries and select the best wellness story as our winner. We included journaling as part of the program because we believe it will help people achieve their goals and help them share their journey with others. Terry has done so much reading on the topic, I asked her to author a guest blog post to share some thoughts that our contestants might find helpful. 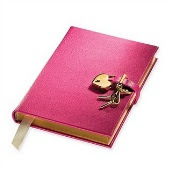 I remember being around 10 years old and my mom giving me my first diary (complete with a lock and key). I was so excited to write in it each night before going to bed. My friends and I would meet the next morning at school and talk about our diary entries, which always seemed to include the boys that we had secret crushes on. Well, for me, that ritual of writing in it each night lasted all of a month or so before I got bored with the whole routine, stopped writing, and put the diary on a shelf someplace. Fast forward to the Oprah age and a few years ago when she started talking about how she’d kept a journal since the age of 15. She started encouraging everyone to keep a gratitude journal. I thought that was a wonderful idea since I had so much to be thankful for. I went out and purchased a nice journal and tried to get into the habit of writing three things that I was thankful for on a daily basis. Again, the novelty of that soon waned. Over a year ago, I started working out and wasn’t going to classes consistently. I’d think of every reason imaginable not to go; it looks like rain, it’s sunny out, I ate too much for lunch, or whatever. Someone suggested I keep a journal and write down my thoughts about attending afternoon fitness classes each day. I did that for a few weeks and stopped. However, what I did realize was that I’m a morning person and by late afternoon my energy level is low. Did I come to that realization through journaling? To be honest, I think not! I’ve come to the conclusion that the traditional approach to journaling just isn’t my thing. However, had I been aware of these tips (such as write in different conditions: awake, sleepy, tired, sick, etc.) and this Writing Through Life site, I may have thought differently about it. I may not have been very successful with the typical paper-and-pen journal method, but I strongly believe that the act of conscious reflection in whatever form is the real benefit. Journaling provides ways to shape inspiration, examine feelings, brainstorm, provide clarity, and provide a means for reflective thinking, but there are other methods that can be used to serve the same purpose. A blog is the first that comes to mind. I’ve come across some great blogs; one of my favorites is Iowa Girls Eats. It’s well written and always has nice pictures. Check it out and see what you think. What do you think about using photos, paintings, pictures, videos, and so on in the place of traditional paper-and-pen journaling? Share your thoughts in the comment section below (text only please! ).